Going through and discussing the individual gameplay aspects of IL-2: 1946 is somewhat redundant to be honest. There will be some new players of the series and I will go briefly into the aspects of the game — like campaign structure — but long term fliers of the series might find this section somewhat redundant and may want to skip to the next section. Essentially, if you have IL-2:FB / AEP / PF then you already know the structure of the game. The game ships with three offline methods of playing the game and one online TCP/IP method. In addition the game can be accessed and flown via several client servers including Ubisoft’s own service. The most popular service is Hyperfighter. Offline single missions are available, and well over 100 single missions are available in the game. This seems like a lot, and it is, but remember that there are over 75 different individual aircraft flyable and if you count subtypes you have 225 different aircraft that are flyable in the game. A large number of the aircraft simply don’t have any single missions attached to them. This isn’t anything new, for a long time aircraft have been rendered but can only be flown online or via the full mission builder. The solution of course is the full mission builder, which will be mentioned later in the review. The nice thing is that single missions are downloadable and there are literally thousands of them on the web. In addition quite a few “payware” campaigns and mission packs are now available on the web for download or CD purchase. These missions range from simple training (i.e. carrier takeoff and landing) to a variety of ground attack and fighter missions as well as few carrier and ship attack missions to spice things up. In general you will get a feel for many of the different types of aircraft in the game by playing the single missions I still feel that this is potentially the most ignored feature of the game. Since most missions can be found online and there are so many user created missions, I get the impression that the developers decided early on to let the community create the lion’s share of missions for the game. I wonder what new people, or people that don’t surf the web that often will find when their desire to fly the F4F in the game is either limited to a campaign or to training missions. I really wish they would have added a few single missions with the patches they put in place over the years. User missions would have been fine, then there could be a nice library released with this large DVD. As it is now the single missions feel almost tacked on. If you buy the game, and don’t particularly care for campaigns then get online and look for single missions. If you want to shoot something down and don’t want to look for that single mission for your favorite aircraft, there is an option that works pretty well. 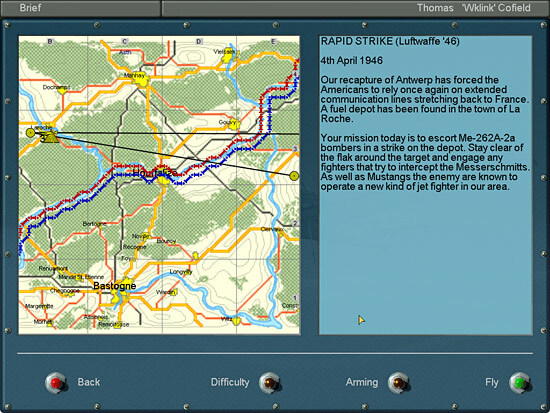 A quick mission builder comes with the game that allows you to fly any flyable aircraft in the game. You can select between bombing, fighter vs. fighter or intercept missions depending on what you want to do. You have the option to fly 16 vs. 16 different aircraft against each other and you can adjust the talent level of your opponents as well as your ai. flight mates. You can set the time of day, weather and whether you or your opponents are at an advantage. If I had only one real gripe with the quick mission builder, it is the lack of maps that you can duke out over. Basically there are five different maps out of the total number (over 40) of maps that come with the game. Essentially the maps are representative of different land styles (Moscow, Pacific Islands, etc.) so you can imagine fighting with the correct aircraft for the times but it would have been nice to set up a quick single mission over Singapore or Pearl Harbor or Leningrad. This isn’t a major gripe as well, but something that I, and I guess many others, would have liked. Again, after all of these years I am curious as to why something like this wasn’t added. The meat of the offline component is of course the campaigns that come with the game. A variety of both linear and dynamic campaigns ship with the game, something akin to over 40 different individual campaigns are available in IL-2: 1946. This is amazing when you consider that most contemporary games are lucky to ship with two different sides fighting, much less campaigns that cover almost every front that saw action during WWII. You have the option to fly for standard powers like the Stavka, Luftwaffe, RAF, USAAF, USN, IJN, IJA, even Romania and Finland, in limited campaigns. Bomber and fighter campaigns are available as well as campaigns covering the European and Pacific theatres of the war. Some campaigns have more appeal than others. Many of the early war Russian campaigns are more exercises in staying alive, just like the later war German campaigns. The dynamic campaigns in the Pacific can often result in repeated sorties to search for enemy ships; something that was certainly true during the war (Oh my, a PBY aircrew’s life had to be boring most days) but it doesn’t make for exciting gameplay. Luckily, user made and after market campaigns have been created which increase the action for most of us. Most of these are not dynamic, but they can be exciting. In addition, the IL-2: 1946 disk introduces some home grown linear campaigns that are new to the Forgotten Battles universe. Overall the dynamic campaign structure in this game has been a mixed blessing. 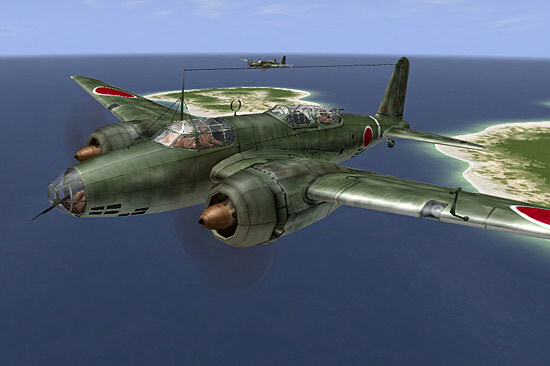 I remember when the first version of IL-2 came out and there was a clamoring for dynamic campaigns; a lot of it from me. Oleg responded and Forgotten Battles came out with a fully dynamic campaign that was okay, but slightly under whelming. Sometimes you had better watch what you ask for, you might get it. Still the campaigns, with their limitations, are not terrible and there are a lot of short and even long campaigns available that can increase the enjoyment of the game. Multiplayer is also very robust. Gone are the days when you might be lucky to get two or three people into a game without the thing crashing. 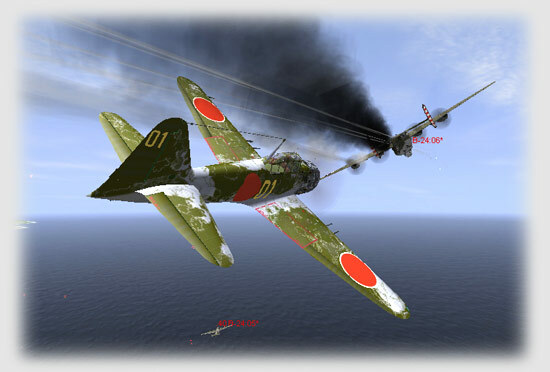 The game supports up to 128 individuals in dogfight arenas and up to 64 are capable of playing cooperatively in a game. Most people go through a service like Hyperfighter to meet up and play with squadmates and to find battles. It is rare that you see a dogfight arena with more than 64 folks enabled. While 128 is possible there is still a problem with most systems not being able to effectively host games that large. IL-2 is not quite capable of taking over online gaming from some dedicated games like Aces High or Warbirds, but it is certainly closing the gap. There have been rumors that Maddox games would like to make a Massively Multiplayer Online Game (MMOG) out of the engine. It would be an interesting concept, something I could actually see being created. I don’t know if it would take the place of games like Aces High, but it would be some real competition, especially if Maddox games could keep the monthly fee low. Coop games can be arranged by creating missions with blue and red forces assigned to different aircraft. Realism settings are set in both dogfight and coop missions by the host. The nice thing about places like Hyperfighter is the ability to look at a dogfight room and see what the host settings are. Everything from icons to views to settings covering flight models and even skin downloads are coverable by the host, as it is in offline games. If you can’t find an online game you like, you aren’t looking.